Before you get your motor runnin’ and head out on the highway, do you know if you have the right insurance coverage for your motorcycle? The answer may not be as simple as you think. While this is the minimum coverage you are required to carry by law, if you think about it, some of these numbers are relatively low. For example, if you are injured while riding your motorcycle, medical treatment can quickly exceed $8,000, depending on the extent of your injuries. You would be responsible for all costs above that. The requirements also don’t include comprehensive or collision coverage, which insures your bike in case of theft or damage. 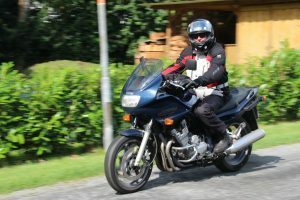 Motorcycles are easier to steal than cars or larger vehicles, and the recovery rate is much lower. They can be sold intact or for parts. In addition, many motorcycle enthusiasts equip their bikes with aftermarket parts and accessories, which further increases their value. To help cover the cost of replacement in case of theft, consider adding comprehensive coverage to your policy. It’s important to note, however, that this only covers the original bike and its parts. If you’ve added custom aftermarket parts, you should add additional coverage. Ideally, you should know the exact value of any custom additions to your motorcycle so that we can provide you with your best possible options for coverage. There are a number of factors that determine what your insurance costs will be, including your age, driving record, where you live and what type of motorcycle you own. There are also a variety of ways to reduce the cost of coverage in some situations, such as if you’ve completed a rider-training course, you store your bike in a secure location, or you have an alarm system. Some of our customers who ride motorcycles ask if they can save money by only purchasing coverage during the spring and summer months when they ride the most. However, in most cases, the minimal savings don’t make up for the inconvenience and increased risk. You wouldn’t be covered if you decided to take the bike out during unseasonably warm weather in the winter––which we get fairly often in New England. In addition, you would also not be covered if your motorcycle were stolen or damaged over those months. A compromise option is a lay-up policy. This option suspends all coverage except for comprehensive, which covers your motorcycle in case of theft or damage. You still wouldn’t be able to ride the bike in the winter months, but if a fire breaks out in the garage where you store it, of if your bike is stolen, you wouldn’t face a complete loss. If you need motorcycle insurance, contact us. Before you go looking for adventure, or whatever comes your way, we’ll help you with the coverage you need and the protection you want.